Holy smokes, it’s been a long time since I posted a recipe! It’s been a wild month- Christmas, my husband’s birthday, my birthday, a visit to California, back home, my son has been sick… whew! I’m worn out just typing all that out. But we’re back! And I’m here with a brand new whole30 recipe. I’m in the middle of my second whole30 right now and LOVING IT! Whole30 is the best. If you are unfamiliar, whole30 is 30 days of cutting out the following: grains, gluten, sweeteners, legumes, dairy, alcohol. The best part is the reintroduction phase because you are able to discover your food triggers and possible sensitivities. I always feel and look my best during whole30. This round of whole30 has been much easier for me than the first. Probably because I’ve been implementing more whole30 recipes regularly and using what I learned from my first round in my daily life. Sweet potatoes are one of the ways to survive and thrive on whole30! Whole30 bacon is kind of hard to find and prosciutto is usually just pork and salt so it’s a great option for breakfast. 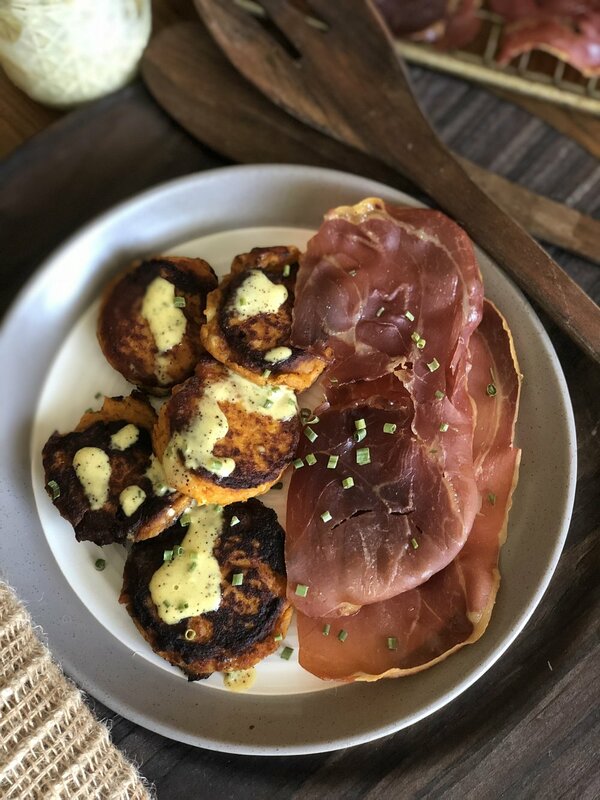 These are very similar to the potato pancakes my mom made when I was a kiddo, they’re just whole30 compliant! 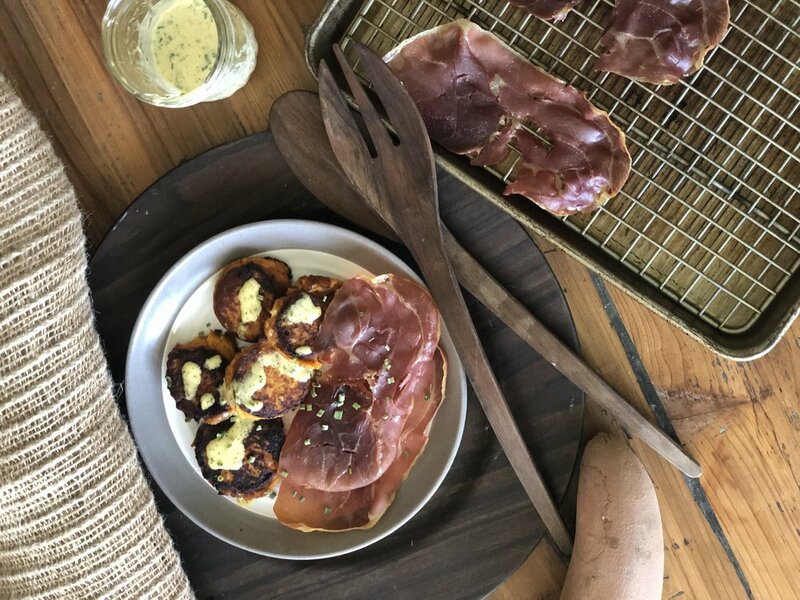 This recipe has a lot of components, and you’re the boss so if you don’t want to make the prosciutto to go along with it, then don’t! But it really is a great compliment to the fritters. The aioli is DELICIOUS. It took the fritters to new heights and I’m so glad I chose to add it to the recipe. I make my homemade mayo honestly all the time during whole30. If you hate mayo, I get it. But have you ever tried homemade mayo? It’s truly not even in the same ballgame. It’s the best and so easy! I hope you guys love this recipe as much as I do! Happy whole30! Boil and mash sweet potatoes. Let cool. Add all other ingredients and mix. Turn a nonstick skillet on medium-high heat and add ghee to the pan. Use a cookie scoop to spoon batter onto skillet. Leave alone for at least 1 minute. Flip and press down gently. Flip twice more so they cook completely. Keep leftovers in the fridge and reheat. Preheat oven to 350F. Line a baking sheet with a wire cooling rack. Gently place prosciutto on rack and bake 15-20 minutes, depending on desired crispiness. Keep an eye on them so they don't burn! Mix all ingredients and spoon over fritters. Keep in the fridge for 3 days. Add all ingredients but oil to wide mouth container. Using your immersion blender, begin to blend, slowly adding oil. Keep immersion blender pressed on the bottom of the container for at least 5 seconds. Slowly raise blender and mayo will thicken. Keeps in the fridge for 5 days.